One top priority when designing online training courses is to motivate and inspire employees, but what type of motivation are we really trying to tap into? Not all sources of motivation are created equal. While intrinsic motivation centers on internal factors, extrinsic is all about external rewards. According to Brown (2007), "Extrinsic motivation refers to our tendency to perform activities for known external rewards, whether they be tangible (e.g., money), or psychological (e.g., praise) in nature". Noël Coward, the well known for his talent, style, and wit English composer, once famously said: “If you must have motivation, think of your paycheck on Friday”. There couldn’t be a better way to describe extrinsic motivation. Opposite to intrinsic motivation which comes from within, extrinsic motivation comes from outside; it is basically the desire to reach a goal that is separate from the activity itself. Extrinsic motivation pushes us to perform a task which we may not particularly like or be interested in, but we stick with it because we know that there will be a reward at the end. The mechanism of extrinsic motivation may sound shallow, and perhaps not as noble as intrinsic motivation, but when you get rewards like money or success out of the picture, it actually makes perfect sense: we clean our desks because we enjoy working on a clean desk, not because we like cleaning. But money and success aren’t impractical motivators either; at the end of the day, payroll, promotion and professional recognition are the immediate or delayed payoffs that motivate employees to try harder, perform better and be more productive. Indeed, extrinsic motivation can be a very powerful force; sometimes, even the most difficult goals become feasible, only because there is something to look forward to at the end. This article explores what every eLearning professional should know about extrinsic motivation in online training deliverables. Although it is best to incorporate a healthy mix of intrinsic and extrinsic motivational strategies into your online training strategy, an extrinsic motivational approach can be proven quite effective for your online training deliverables. 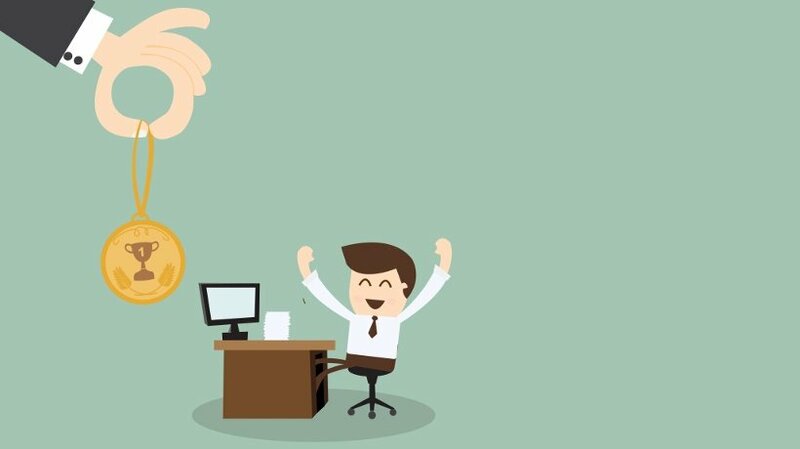 Employees are usually more extrinsically than intrinsically motivated to perform the tasks assigned to them, so it is more likely that they will "appreciate" incentives that inspire their extrinsic motivation. With respect to your instructional design, always keep in mind that there are some potential side effects of adding extrinsic motivation elements in your online training deliverables, such as, that they may only provide short-term benefits as motivation is lost when the reward is removed from the picture, or that, they may motivate employees to reach their goal, but they might not care so much about the process of learning from their mistakes. Other limitations are that it may be difficult for you to determine appropriate rewards, as well as the fact that when adding extrinsic motivation in eLearning, you always run the risk of sabotaging intrinsic motivation. On the other hand, there are some obvious benefits, such as that it can quickly change learning behaviors, it can induce interest in an online training activity, and, above all, that it provides quick results. The truth is that, no matter how valuable intrinsic motivation may be, it is not always possible to inspire it, as sometimes employees are simply not interested in performing a particular task. If this reminds you of your employees being reluctant to fully engage in online training, here are 5 tips to increase extrinsic motivation in online training in order to offer them a highly motivational online training experience. Provide employees with a Diploma or Certification after online training completion. As an eLearning professional, you cannot, of course, offer to employees salary raises or promotions to motivate them to complete their online training. But you can provide them with a certification or diploma that acknowledges their contribution to the company by achieving their goals. An online training certification can not only significantly increase your audience’ extrinsic motivation to actively participate and engage in the online training course, but also boost their performance after completing it, as they will have developed the desired skill sets. A performance management online training strategy can be particularly effective, but to increase extrinsic motivation in your employees you need to integrate “prizes”. Gamification is an effective way to link performance to rewards, as your audience can reach their goals while being rewarded with high ranking in different levels of difficulty, as well as being given the opportunity to reinforce their feelings of mastery and achievement. It can give your employees the opportunity to learn and to actively participate in the online training without even realizing it. They strive to progress through the levels or earn points, and in the process they absorb knowledge and engage even more in the online training experience. However, there is a caveat to using gamification as a source of extrinsic motivation, that is to ensure the game elements are tied to the goals and learning objectives of the online training. You should never include a game simply because it is entertaining and engaging, but because it offers employees a more effective means of acquiring new knowledge and skills. Show employees the impact of online training on their job performance. When employees see how their online training will benefit them in their career growth, this becomes by itself a reward. To help them understand that their online training experience can be truly rewarding, always make sure that you show them how they can put what they are learning from theory to practice. Use scenarios with real world applications that help your audience relate to their online training content. It should be obvious to them that the online training they attend, not only provides them with the knowledge to make their jobs easier, but at the same time it is there to enhance their skills and boost their performance, with all the desired forthcoming consequences, such as opportunities to progress their careers, raise, promotion, etc. Recognize achievement and offer positive feedback in public. In extrinsic motivation, the rewards become the primary goal of the online training rather than acquiring new knowledge and improving skill sets. Recognition, especially in front of others, is key in increasing extrinsic motivation. Without an effective feedback system in place, an online training strategy that centers on extrinsic motivators simply cannot be successful. Satisfy your audience’s need for extrinsic praise and reinforcement by providing them with positive feedback throughout their online training experience. When employees feel that their efforts are recognized and appreciated, it will be more likely for them to be interested and actively participate in their online training. Utilize extrinsic motivators as a bridge to intrinsic motivation. Extrinsic motivation is less favorable than intrinsic because it lacks the internal drive and determination that is so important in the learning process. However, extrinsic motivation can be used to eventually encourage employees to develop a sense of intrinsic motivation. For example, if employees don’t show much interest in the subject matter or don’t actively participate in the online training, then extrinsic motivation can offer them a way to improve their performance and become more involved, so that they are able to see the true benefits of participating. Once they begin to be fueled by internal motivators, the extrinsic rewards will become less important and can be slowly removed from the online training course. When designing extrinsic motivation elements to include in your online training, always keep in mind that rewards should be secondary to knowledge absorption. The reward system that is put in place should not be the primary focus of the overall online training experience, but merely a tool that helps learners absorb and retain the knowledge. The rewards offered as extrinsic motivators in online training must link directly to employee's improvement, progression, and performance. Now that you know how to use extrinsic motivation in online training, you may be interested in learning more about how to create a motivational eLearning experience. Read the article 5 Tips To Enhance Motivation In eLearning and discover how you can inspire your learners to eagerly experience your eLearning deliverable.